Workers assemble miscellaneous components and parts (piecework), including refrigerator components, nut & bolt packages, and cardboard spacers. Assembly provides repetitive work opportunities and continuous work opportunities, paid by-the-piece of completed components. Piece work is done in-house, but the opportunity to work at a Communityemployer is available through our PHASE South location. 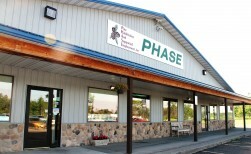 Both PHASE North and PHASE South offer varied structured Program activities for the "work activity" area. Though the activities and agenda very slightly, you will find both are tailored to meet individual needs and abilities of the consumers. We focus on providing employment opportunities for the population we serve, and work with each consumer to meet their individual goals. In addition to the employment opportunities, we also offer structured activities, to maintain and build reading skills, math skills, fitness and their hobbies. PHASE Recycling is a great opportunity for those who value earning a paycheck, as it provides consistent work Monday-Friday, throughout the year, which enables workers to better budget their funds and provides a dependable source of income. Recently, PHASE South started PHASE Furnishings, an on-site Furniture store which provides consumers the opportunity to work in a retail environment, while expanding their skills in assembly and wood-working.